BLACKSBURG, Va., April 11, 2006 – Roop L. Mahajan, an internationally known researcher with expertise ranging from nanotechnology to bio micro-electro-mechanical systems (Bio-MEMS), will become the director of Virginia Tech’s Institute for Critical Technology and Applied Science (ICTAS), effective July 1. “We are extraordinarily pleased to secure a person of Dr. Mahajan’s stature to become the director of our research institute,” said Richard C. Benson, dean of Virginia Tech’s College of Engineering and the director of the ICTAS Stakeholder Committee. Benson led the six-month search for the director. Mahajan comes to Virginia Tech from the University of Colorado at Boulder where he is the founder and current director of the Center for Advanced Manufacturing and Packaging for Microwave, Optical and Digital Electronics (CAMPmode). Since 1992, CAMPmode has functioned as an industry-consortium sponsored center. In 1995, the center became a National Science Foundation Industry/University Cooperative Research Center. CAMPmode currently focuses on nanotechnology and on MEMS. Mahajan is also the founder and current co-director of MicroElectronic Devices in Cardiovascular Applications (MEDICA). This interdisciplinary center draws on faculty at Colorado University’s Health Sciences Center and its College of Engineering and Applied Sciences. Its purpose is to foster scientific advancement in the study and application of MEMS in cardiovascular applications. “Dr. Mahajan’s efforts in these interdisciplinary fields, as well in cellular engineering microsystems (CEMS), artificial neural networks, humanistic engineering, thermal sciences, and solar energy, makes him a true Renaissance man for the ICTAS directorship,” Benson said. ICTAS leverages Virginia Tech’s existing research strengths and builds on the synergies of Virginia Tech’s talented faculty to pursue multidisciplinary research. Two buildings are currently under construction at Virginia Tech to house the multi-disciplinary ICTAS research. One is the Advanced Materials Characterization Facility, scheduled for completion later this year. This facility will be 32,000-square foot building, half of it housing the Advanced Materials Characterization facility. That laboratory will supplement extensive current materials testing capacity on-campus. It will eventually house the university’s recently delivered world-class Transmission Electron Microscope (TEM) and the state-of-the-art Secondary Ion Mass Spectrometer (SIMS) that will arrive in 2006. The facility will also be constructed with the capability of housing a Nuclear Magnetic Resonance (NMR) operation. Groundbreaking is planned for the second building, currently called ICTAS I, later this month. This building, which will house the School of Biomedical Engineering and Science, a joint project with the Wake Forest School of Medicine, as well as other state-of-the-art research, should be completed in early 2008. It is located next to the current complex of engineering buildings on campus. Mahajan, who holds the Roubos Chaired Professorship of ME at Colorado, has received numerous awards including the American Society of Mechanical Engineers (ASME) 2003 Charles Russ Richards Memorial Award for outstanding achievement in Mechanical Engineering. He also received the 2002 ASME Heat Transfer Memorial Award, and the Subaru Educator of the Year Award in 2002. He is an ASME Fellow. He holds three patents and has five invention disclosures. 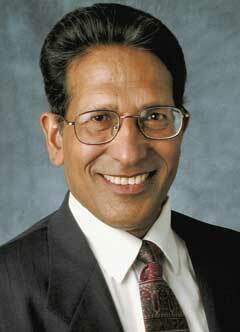 Mahajan was employed by AT&T Bell Labs from 1979 until 1991 as a research leader and supervisor in thermal and computational engineering. He received the Bell Labs Fellow Award in 1989, an honor bestowed to only about one percent of the entire technical community of Bell Labs. Mahajan received his Ph.D. from Cornell University and his bachelor’s and master’s degrees from Punjab Engineering College, Chandigarh, India.